Pickleball times available upon request for groups of 4 or more. 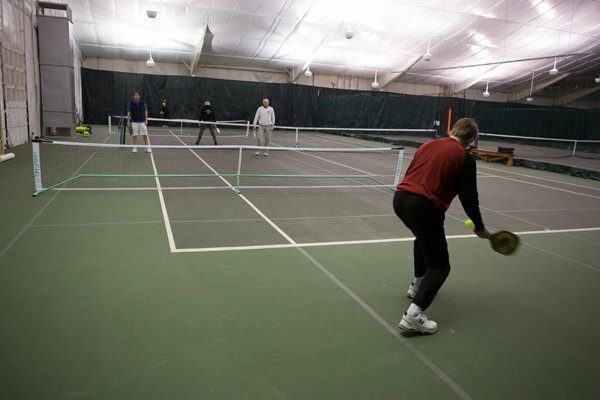 Pickleball at Maine Pines! Try one of the fastest growing sports in America! 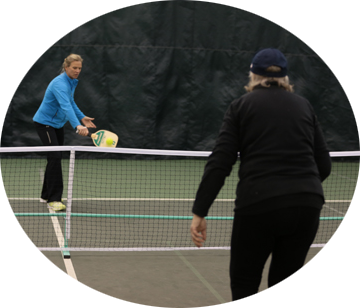 Pickleball is friendlier on your knees, backs and shoulders than Tennis, and is a very easy sport to pick up whether you have a racquet sports background or not. It is fun, fast paced, good exercise, and very social. Try it! We have 4 official courts lined out on tennis court #6 and the nets can be set in place in seconds. Courts can be booked between 12 PM – 3 PM Monday through Friday, and weekend times available from 12 PM and later. Courts are not available when a tennis tournament or league may be happening. COST: $4 per play, or free if you have a Maine Pines fitness or tennis membership.